Autographed copies of Gary Giddin's book Bing Crosby: Swinging on a Star, The War Years 1940-1946 will be available for purchase. 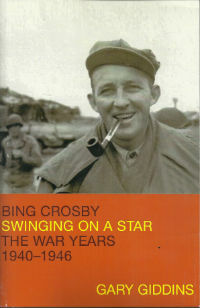 Gary Giddins’s Bing Crosby: Swinging on a Star, The War Years 1940-1946 is the story of the most popular performer of his time, an artist who transcended differences in age, gender, ethnicity, religion, and politics. It depicts the home front at a time when entertainment was “no mere diversion but a necessity.” Much of the world huddled around his recordings (including “White Christmas,” still the best-selling disc of all time, his Academy Award-winning performances as Father O’Malley in Going My Way and The Bells of St. Mary’s, his irreverent forays on the Road with Bob Hope, and his weekly radio staple, Kraft Music Hall. Giddins will speak about Crosby and his book, and introduce his most honored film, Going My Way.